Today, the Morgan Silver Dollar Coin remembers the vintage news of April 23, 1914 where Mrs. Mooney frustrated the Pinkerton’s detectives. Wife of Toiler Who Claims Himself the Victim of an “Explosive Plant” Scoffed at Detectives Who “Shadowed” Her — Finally They Got Sick of Their Job. This pretty, purposeful young- matron rid herself of the constant espionage of Pinkerton’s by making a public joke of them. She is Mrs. Rena Mooney, wife of Thos J. Mooney, a working man who declares from behind prison bars that he has been, made the victim of an “explosive plant” conspiracy by sleuths in the employ of the Pacific Gas & Electric Co. to get him out of the way. His wife, mother, sister and brother were for months subjected to annoyance by the corporation hirelings. But in Mrs. Mooney’s case, wit and affronted innocence proved too much for paid espionage. “I couldn’t deliver a jaw-breaker to the burly men who followed me day and night,” she says, “so I decided to give them a dose of their own medicine. I trailed the trailers—spotted the spotters— until they became sick of the business. Her level blue eyes twinkled, then became somber. “Under my mask of nonchalance, however, I was furious. They had goaded me beyond calm endurance, although I had nothing to fear or conceal. “I was alone against dozens of men and women operatives, and was in constant fear that they would ‘plant’ something against me, manufacture some evidence to get me into jail, as they did my husband and the other two boys. “They will -probably put my husband in the penitentiary. ”But that can make no difference with me. It is no disgrace. “I’d rather be the wife of a working man Imprisoned because of active interest in hastening a better day for his kind than the coddled companion of a smug millionaire who In his brutal selfishness is indifferent to the fate of others. “If Tom goes to prison I will carry on his work—spreading the leaven. He has changed me since our marriage. I know what he is trying for. And I shall try for it, too. “I have a great opportunity. Here in my conservatory I teach dozens of eager, brilliant children. I bend the twig. And I teach more than music, do you understand, more than music! So, what happened to Mr. Mooney? Was he convicted or acquitted? Thomas J. Mooney, acquitted today of a plot to destroy property of the Pacific Gas and Electric company at Martinez, is still facing a charge here of transporting explosives on a Sacramento street car. He has been bound over to the superior court and is out on bail awaiting trial. Mooney is alleged to have been implicated with Warren K. Billings, now serving a term at Folsom on the same charge. The only evidence introduced at Mooney’s preliminary hearing tending to show that he was involved in the Billings’ case, was that of a private detective employed by the Pacific Gas and Electric company who swore that he saw Mooney at the Southern Pacific depot here the night Billings arrived from San Francisco with a suitcase, and it was testified it contained dynamite. Thomas J. Mooney, a striker in the recent Pacific Gas and Electric labor troubles, is freed today on a charge of transporting on street cars in connection with the case of Warren K. Billings, now serving time at Folsom on that charge. Mooney was discharged by Police Judge Christiansen, who ruled that the evidence was insufficient to hold him. Mooney was recently acquitted on a similar charge at Martinez. So, was Mr. Mooney framed for the crime? Or, was it a case of insufficient evidence? 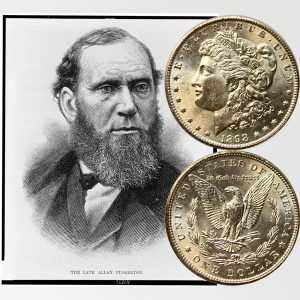 The Morgan Silver Dollar Coin shows with an artist’s image, circa 1884, of Allan Pinkerton, the founder of the detective agency.